At Bishop Moore Catholic High School, we have a long standing tradition of excellence in performing arts. Whether it is with our choral program or the black and gold brigade, you will find our students consistently receive top honors. If you were to explore the hallway outside the band room doors you would find a well lit display case overflowing with trophies and memorabilia. Each item has a story and reflects a legacy of excellence left by dedicated students and faculty dating back to 1960. Lining the walls are pictures of those students, shoulder to shoulder in various uniforms of black and gold. Each one a testament to those that came before them. Bishop Moore High School's Choral Program provides students the opportunity to experience vocal music in a variety of styles through rehearsal and performance. There are several choirs and ways to be involved in vocal music at BMC; Womens Choir is a non-auditioned choir open to 9th-12th grade students, Concert Choir is a mixed choir of auditioned students in 10th-12th grade, and our Liturgical Choir is non auditioned and is open to all students. Liturgical Choir meets after school during 9th hour on Mondays, Tuesdays, and Thursdays. 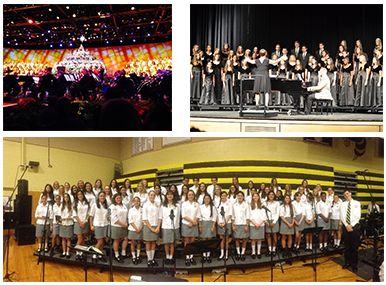 Our choral program continues to grow each year as well as our standards of excellence. We consistently have Bishop Moore students represent our choirs at the Florida All State Choir in Tampa as well as the American Choral Directors Association Honor Choir. BMC choirs consistently earn superior ratings at district music performance assessments and solo and ensemble festivals. Our choirs have been selected to sing in Disney's Candlelight Processional at EPCOT Center, the National Catholic Educators Association conference, and they have even performed at the Orlando Magic Basketball games. All choirs are full year curricular courses which provide students with an arts credit. Liturgical Ensemble is offered during 9th hour three days per week, but all other chorus classes meet during the school day. Please email Sarah Purser for more information.